Getting your oil changed in San Antonio has never been easier. Our experienced mechanics create a friendly and professional atmosphere, and make sure our customers’ comfort and convenience are the top priority. Stopping in for an oil change may just be something you don’t have time for. Therefore, you delay, postpone, or ignore your engine’s most vital maintenance. We promise to save you time through our efficient workmanship, and money through our affordable services. 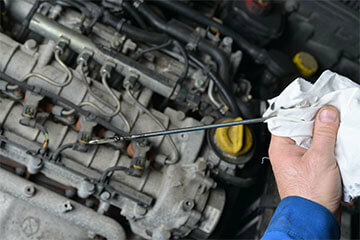 Oil changes are your most important type of maintenance, and that’s how we treat it, with the attention it deserves. Every vehicle is different, just as every driver is different. Depending on the vehicle and the driver’s needs, we can determine what you should be using. Drivers accumulate a lot of mileage on their vehicle, whether its through their daily commutes, or through street racing. But we have experienced technicians that will let you know exactly what type of oil you should be using, and how often you should be changing it. The manufacturer’s recommendations for your oil change intervals are the best source of information for our team. However, the vehicle’s age and its driving conditions need to be taken into account. Should you be using synthetic oil or standard grade oil for oil changes? We’ll let you know what works best for your situation. Our customers come back to us because of our impeccable customer service. Our history in this community has allowed our customers to become familiar with us, like part of our own family. As they come back to use our services, they become used to being treated as such. We love it when our customers feel free to inquire with us about any problems they might be experiencing, while they’re receiving their receiving any vital maintenance. Oil changes and quality technicians are always meant to improve your vehicle’s overall performance. For your convenience, we have two San Antonio locations to serve you; 6411 San Pedro Ave and 1291 New Laredo Hwy.